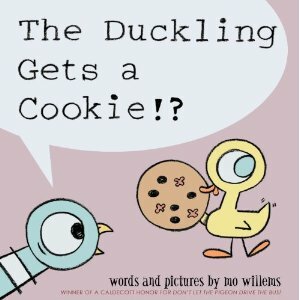 Kids' Book Review: Review: The Duckling Gets a Cookie!? Review: The Duckling Gets a Cookie!? The king is here! The king of the modern picture book in my eyes anyway. Mo Willems. Seriously, if you have not slapped your eyes on a Mo Willems creation before, you need to get some Mo! Besides being a best-selling and award winning author, Mo began his career as a script-writer/animator and garnered six Emmys for his writing on Sesame Street. It is safe to say, the man knows his stuff. In The Duckling Gets a Cookie, the ever angst-ridden and manic pigeon is back with his old mate, Duckling. Now there is no burying the lead there with that title, that is indeed what happens in this book ... and doesn't the Pigeon get the irrits! The pigeon launches into a massive rant about the fact that he never gets anything. Oh he asks, boy does he ever ask, but does he get anything? Nooooooooooo. After his diatribe, Duckling interrupts to tell him that he got the cookie for him ... make sure you have a read to see what wee Duckling is up to. It is set against gentle pastel colours, but don't let that fool you, the energy of this book is off the chart and the illustrations are perfect. Lots of giggles to be had with this book. Mo hits it out of the park again. This book is genius. Get Mo!